Plug plants are usually known as "seedlings," but they are sometimes referred to as "plugs" because the small plants resemble plugs when they are removed from their celled nursery container. Many plants are available in plug form, including annual flowers, vegetable seedlings, lawn grass and even trees. Plugs are more expensive than seeds, but planting plugs means that the plants are already partially established before they're planted in the soil. Prepare the soil for planting the plugs ahead of time. Although specific preparation will depend on the type of plant, it's likely that the soil will need to be worked with a tiller or a spade to a depth of at least 6 to 8 inches. If the soil drains poorly, improve drainage by incorporating 2 to 4 inches of compost or rotted manure. 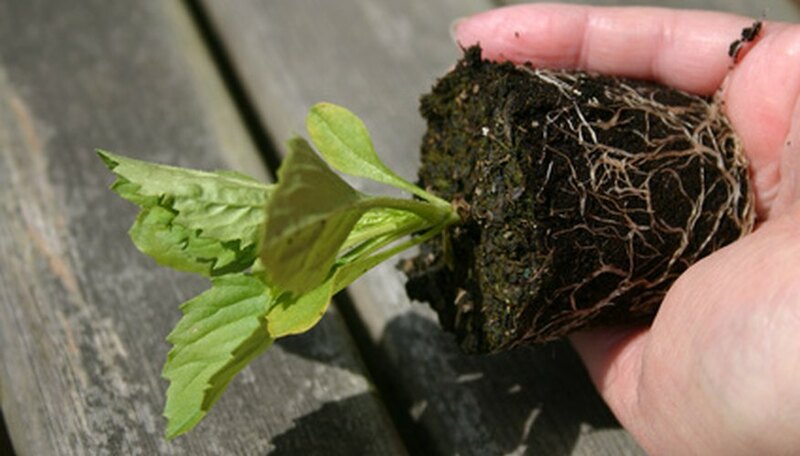 Harden off the plugs before planting by placing them outdoors during the day for about a week so the young plants can become acclimated to the outdoor environment. Place the plugs in a sunny spot where they'll be sheltered from wind and extreme heat. Bring the plugs indoors at night. Most plugs shouldn't be planted outdoors until all danger of frost has passed. Dampen the plugs lightly before planting. Don't water so much that the plugs are soggy. Too much moisture can damage the roots, but if the plug is too dry, it can fall apart during the planting process. Dig a hole just large enough to accommodate the plug's root casing and plant the plug at the same soil depth it was planted in the nursery container. (If the plugs are tomatoes, they can be planted deeper.) Squeeze the bottom of the plastic container carefully to release the plug. If the plugs are in a large tray, separate them with a trowel or a putty knife. Water the plugs immediately after planting, using a garden hose with a fine spray attachment. Keep the soil evenly moist, but not soaked, until you notice new growth. After that time, water the plugs according to the specific needs of the plant.